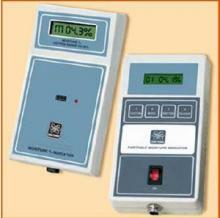 Moisture measuring range available with suitable sensor to meet any individual requirement. Different type of detachable moisture measuring electrodes available to meet any individual requirement. System available with computer interface for lot wise and sort wise data storage. Unit is also available with interface to transmit data to PC using wireless communication. Uses highly stable microprocessor circuit technology to overcome the traditional limitations of measuring moisture by resistance techniques.